On Saturday nights I try and make time to visit some of my favourite blogs, and also follow links to new ones. This Saturday night I found some really clever tutorials, free designs, and some patterns I purchased, so I thought I'd share the links with you - after all, it's great to be inspired by others! I recently came across Clara and Jennie's blog, CLOVER & VIOLET. What a friendly and inspiring pair this mother and daughter are! Apart from their free BOM "Garden Steps", they also share sweet ideas that are simple but oh-so-pretty. Below is a tiny granny square that Clara made into a wee pin cushion. I am going to make one a few of these! If you'd like to learn another way to crochet around fabric be sure to check out Miss Abigail's tutorial HERE. I am really going to do this - even bought an awl a little while ago as preparation. I am LOVING this new-to-me designer! Charlotte Lyons. Her stitchery designs have my heart a beating! Bronwyn Hayes is a fellow Aussie designer, and may I also say that she is one of the most generous with her free designs! Mr E's school holiday break has now drawn to a close, so after taking me for a ride today to Bowen, he's trying to make the most of these last hours of freedom. Easy dinner - scones and tea like my nana used to do every Sunday night. Do you have simple Sunday dinners too? If so, what do you make? Now to iron his shirts, plan his lunches for the week, and get back into the groove of our school term life. Thank you for sharing! 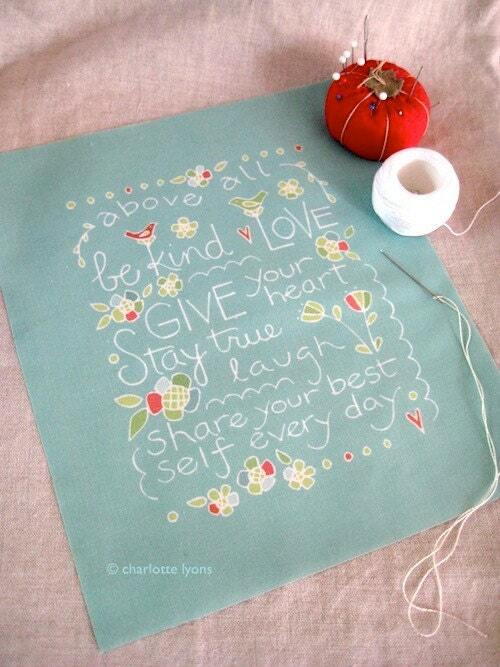 I really love Charlotte Lyons beautiful stitcheries! I love seeing new links to visit and these lady's are very talented. 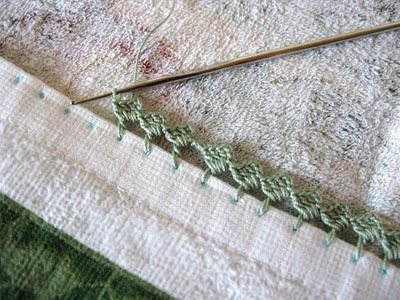 I also like the idea of adding crochet to fabric, not sure I am at that stage yet. Yes, there are so many clever people out there including you. thanks for sharing those ideas. I do like that crochet blanket. I have been following along with a group but like you don't know when I will get to it. Enjoy your day. 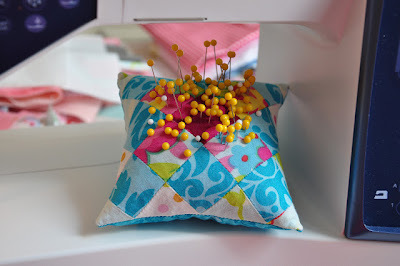 There are lots of lovely people out there in blogland sharing great tutorials and patterns. I haven't seen Charlotte Lyons before. Will have to go have a look. Our usual easy Sunday night dinner is marinated chicken wings and microwave risotto. The risotto is quick as you don't have to stand there for ages stirring the pot! Jenny, you are leading me astray, in the nicest possible way! I have just begun Posie's sampler and this morning ordered a few things from Charlotte Lyon's shop.Thank you for introducing us to these wonderful designers. What a great collection - almost anything pre printed is a favourite of mine - Have I mentioned I hate tracing??? Thank you for sharing, Jenny. I really like the crochet around the fabric. One of my girls would like that too. Scrambled eggs are are a big Sunday dinner in our house!! Love your inspirations...thank you! !